DNA has been a master key unlocking medical and forensic secrets, but its genealogical life has also been notable. Genealogy is the second most popular hobby in the U.S., and the outpouring of interest in it from the African American community has been remarkable. After studying this phenomenon for more than a decade, Alondra Nelson realized that genetic testing is being used to grapple with the unfinished business of slavery. It is being used for reconciliation, to establish ties with African ancestral homelands, to rethink citizenship, and to make unprecedented legal claims for slavery reparations based on genetic ancestry. 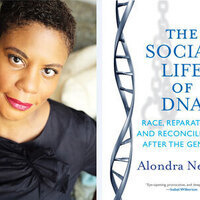 Arguing that DNA offers a new tool for enduring issues, Nelson shows that the social life of DNA is affecting and transforming 21st century racial politics. Alondra Nelson is professor of sociology and Dean of Social Science at Columbia University, where she has served as director of the Institute for Research on Women, Gender, and Sexuality. She is the author of Body and Soul: The Black Panther Party and the Fight Against Medical Discrimination. It was not what I expected, but I enjoyed the lecture. The book signing was excellent! Not only was the author, Dr. Nelson, very informative but she created an excellent dialogue with the audience. Her book seems very appealing and I can't wait to start reading it.